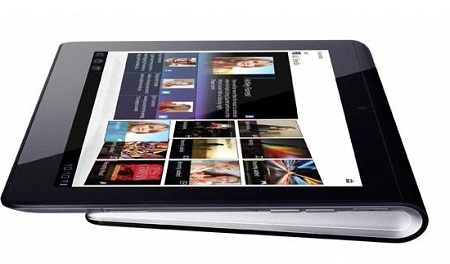 Dixons Group have announced the pre-order of the Sony Tablet S, the new Sony tablet with a 9.4" screen running honeycomb. You can go over there right now to pre-order theÂ 16GB WIFI version for what is actually a decent price of Â£399.99. The 3G version of the same tablet have a Â£100 premium on top of that price. The WiFi only tablet is due on the 16th September, with the 3G version later on in October. Any one going to be pre-ordering this? Currys, PC World and Dixons.co.uk Announce Online Pre-order of the Sony Tablet S exclusively with Sony Today â€“ 31 August â€“ In yet another market first, Dixons Retail plc, parent company of Currys, PC World and Dixons.co.uk, the UKâ€™s largest electrical retailers, is pleased to announce an exclusive window, with Sony, for customers to pre-order their first ever tablet computer, the much anticipated Sony Tablet S series. Featuring a unique, ergonomically contoured design, the Sony Tablet S has been developed to feel as comfortable as a folded magazine. Weighing in at just under 600g, the tablet is easy to carry and provides handheld comfort plus the perfect angle for tabletop touch-typing. Powered by Android Honeycomb 3.1, the Sony Tablet S runs smoothly with web pages and content loading quickly and efficiently as well as looking impressive on the 9.4 inch HD display. The Sony Tablet S is the worldâ€™s first tablet to be PlayStationÂ® Certified, allowing you to enjoy games for PlayStationÂ® Certified devices including original PlayStation games. The Sony Tablet S lets you control your home entertainment devices and share content wirelessly with friends and family. Personal photos and video content can be â€˜thrownâ€™ (streamed) at the touch of a button from the Sony Tablet S to DLNA-compatible TV sets and other devices. Music can also be streamed to wireless speakers and the Sony Tablet S includes infrared technology, meaning it can be used as a fully customisable remote control for multiple home devices including your television, Blu-ray Discâ„¢ player and home theatre set-up. Mark Slater, Category Director at Dixons Retail, commented: â€œSonyâ€™s Tablet S is a real contender in the tablet market and one we expect to be a big success. The two week preorder period for the Sony Tablet S will be a very exciting period for us to see how popular this tablet will be with our customers.â€ The Sony Tablet S is available to preorder online now at PCWorld.co.uk, Currys.co.uk and Dixons.co.uk from 31 August at 4.01pm.